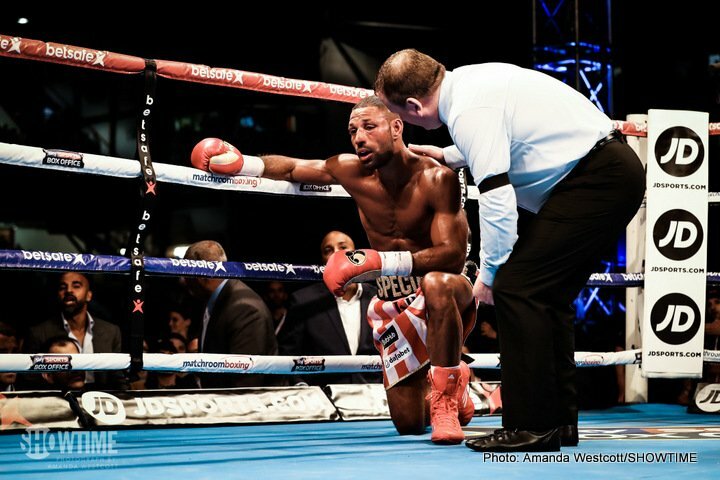 Did the beating he took from Errol Spence, to his facial bones especially, do permanent damage to former IBF welterweight champ Kell Brook? Come to think of it, did the damage Brook took in the Gennady Golovkin fight, which took place eight months earlier, do irreparable harm to the Sheffield warrior? But has Brook been too brave, stubborn even, for his own good? That challenge of GGG, in hindsight looks foolhardy, while Brook, who was struggling mightily to make 147, should perhaps have moved up way sooner than this March. Yes, Spence applauds Brook for opting to defend his belt against him instead of vacating it, but if Brook truly feels he can win a second world title, then should vacating the IBF welterweight belt really have been such a hard thing for him to do? In any case, we will only see how much Brook has left when he gets in there with Rabchenko. Once again, Brook has not picked an easy option. Rabchenko, 29-2(22) is coming off a stoppage loss (TKO 9 by Tony Harrison in July) but he is a proven force at 154, he has boxed and won in the UK before, and he is clearly no pushover. Might Brook come a cropper for a third time running? Kell’s entire fighting career will be on the line the night of March 3rd.